Blow Me... a Raspberry 2 is a berry red scattered holo and it's absolutely beautiful! I applied 2 coats for these pics, and 1 coat of top coat. Mountain Nights is a royal blue jelly with purple shimmer and silver micro-flakes. As it's a jelly, I applied 3 coats for full opacity. No top coat. Sea Glass is a gray crelly with purple shimmers and lots of micro-flakes. I applied 3 coats for these pics, and 1 coat of top coat. 6 Harts Polishes are available on Etsy for $9. 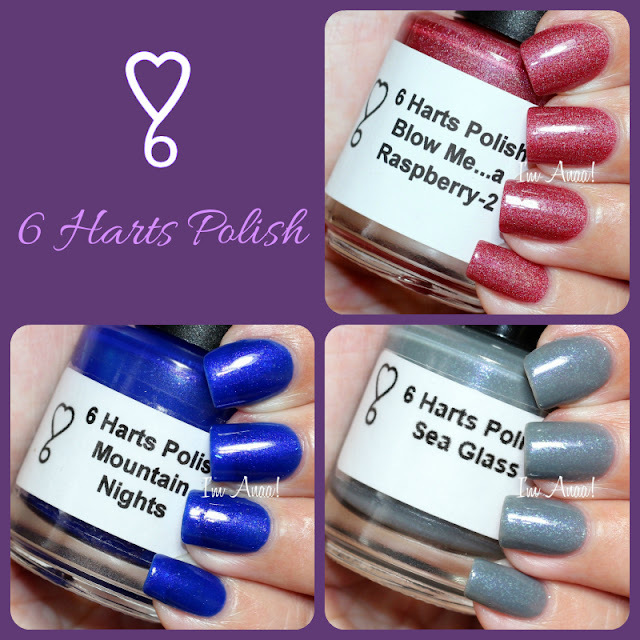 Be sure to follow 6 Harts on Facebook, Instagram and Pinterest. These are all gorgeous! Your manis are perfect, as always!